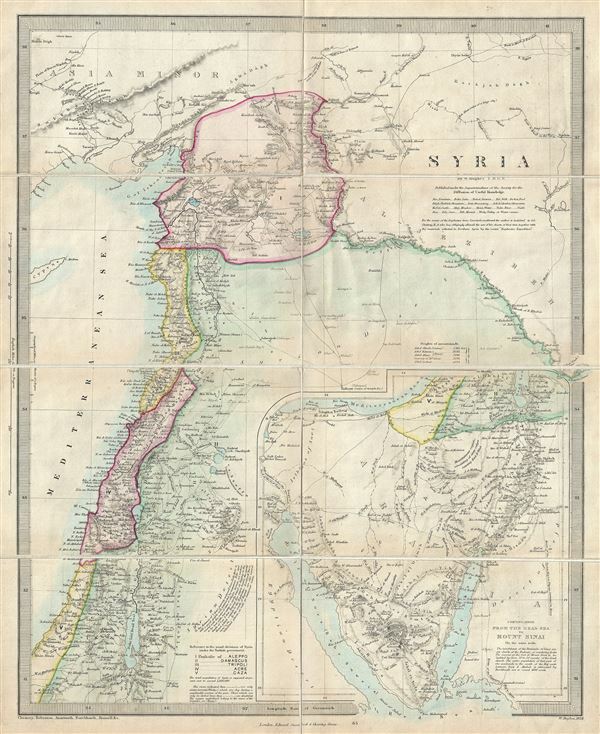 This is a scarce 1858 map of Syria, Israel and the Holy Land prepared by William Hughes. Centered on Syria, it covers from Asia Minor to the Dead Sea. The map is continued on the same scale, from the Dead Sea to Mount Sinai, in a large inset in the lower right quadrant. The modern day nations of Turkey, Syria, Lebanon, Jordan, Israel, and Egypt are included. The map notes the route of the Egyptian Haj to Mecca and the route of the Syrian Haj to Mecca. The sites of numerous ancient ruins and monuments are identified as are cities with ancient and contemporary place names. This time in history marks the decline of the Ottoman empire. Syria was part of the Ottoman Empire and largely ignored by world affairs. The map notes the administrative divisions of the Ottoman Empire which include the Pachalic of Gaza, Pachalic of Acre, Pachalic of Tripoli, Pachalic of Aleppo and the Pachalic of Damascus. Several rivers, lakes, mountains, desert and an assortment of additional topographical features are noted with relief shown by hachure. This map is exceptionally scarce as it is issued as a pocket map, rather than the more common atlas edition of the same. Boundaries are outlined in vivid color. This map was drawn and engraved in 1858 by W. Hughes under the superintendence of the Society for the Diffusion of Useful Knowledge and issued as a pocket map by Edward Stanford, 6, Charing Cross. Very good. Dissected and mounted on linen. Minor toning along original fold lines. Accompanied by original binder. Rumsey 0890.083 (1843 atlas edition). Phillips (atlases) 794.